Knowing where your prospects are in the B2B buying process helps improve communication with your prospects and increases the chance of turning prospects into customers. First, companies must define what buying stages are specific to their business. Only then can companies use strategies to identify where a prospect is in the buying process. In this article, we’ll explore how to define the B2B buying process, strategies to identify where your buyers are in the process, and discuss the benefits of having this information. Sit down with members of your sales, marketing, and executive team to come up with the stages your B2B buyers go through. Start with the three common stages at a minimum and extrapolate from there if necessary. There are three ways to effectively identify where your buyers are in the buying process. Leveraging the use of technology will help with all three approaches. 1. Deduce the prospects behavior during their website visit(s). Did they attend a webinar? Were they looking at pricing or product pages? Did they search for your company using certain keywords? 2. Directly ask what stage the buyer is in on a landing page. 3. Make various unique offers commensurate with the stages of your B2B buying process such as webinars, phone consultations, and self-assessment checklists and gauge your prospects response. Lead Liaison’s revenue generation software provides lead tracking, landing page creation, lead scoring, and lead nurturing technology to help B2B marketers execute the aforementioned strategies. Lead tracking logs website visitor’s actions as they visit your site picking up search terms, pages viewed, landing pages/web forms, and responses to offers. Landing page technology builds dynamic landing pages using a visual, drag and drop editor to create landing pages in minutes. Lead scoring automatically qualifies leads to identify when to hand the lead off to sales. Finally, lead nurturing automates the process of sending relevant content (usually via email) based on a prospects interest and/or stage in the buying process, triggered from their activity or demographics. By identifying the buying process you can send relevant content that your prospects are interested in. Lead nurturing, a feature of marketing automation, delivers this capability. For example, if your prospect is looking at a webpage discussing your market or problems you solve then the prospect is most likely in the “Awareness” stage. At this point, marketers may want to send educational material, such as ROI statements or testimonials, to raise awareness. Alternatively, if your prospect is looking at a specific product webpage or pricing webpage they’re probably in the “Discovery” phase. At this point, you may want to send product-specific content using your lead nurturing system to further educate your prospect. Much like a fisherman catches fish, a marketer can “bait the hook” to develop prospects using material they are likely to care about. Sending relevant content to your prospects will help your company better communicate with your prospects needs, build the relationship between prospect and vendor, and get the prospect to revenue faster. 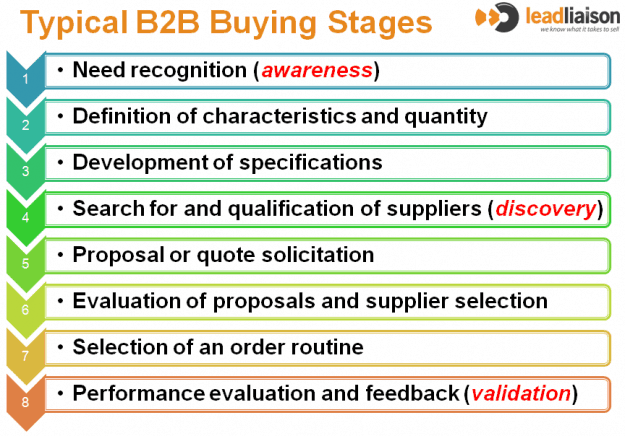 Also, by demonstrating an understanding of the B2B buying process marketers can better measure marketing effectiveness. The lead funnel can be understood and shared with other members of the team. Additionally, gaps in the revenue cycle as the lead moves from marketing to sales can be identified. Pinpointing gaps allows marketers to better understand why prospects are not moving forward in the buying process. With this information, marketers can refocus their marketing strategies to rectify gaps in the funnel. We welcome your feedback, comments and suggestions. What do you do to identify the stage your prospective buyers are in?